If you Google or Yahoo "Famous Rapture Watchers" you will discover that all Christian leaders for 18 centuries were deluded, vicious, and not guided by the Holy Spirit! Also Google "Pretrib Rapture Diehards," "Pretrib Rapture Desperados," "Thomas Ice (Bloopers)," "Wily Jeffrey," "Revisers of Pretrib Rapture History," "Letter from Mrs. Billy Graham," "Pretrib Hypocrisy," "Hal Lindsey's Many Divorces," and "Deceiving and Being Deceived" - all by the same evangelical historian whose research has been praised by those who don't have an axe to grind either for or against pretrib (Google "Scholars Weigh My Research"). And, yes, he is a great patriot (Google "Dangerous Radicals of the Religious Right")! Maria, what do you believe makes supporters of the Pre-Trib Rapture "dangerous?" "His claim to fame was being the very first person to purchase a Disneyland ticket at the age of 22 in July of 1955. He celebrated Disney's 50th anniversary in 2005 with that honorable mention. He began to vigorously attack the pre-tribulation rapture in the early 1970s, claiming his historical research showed that a teenage Scottish girl named Margaret Macdonald came up with the idea in the 1830. This happened when she was a member of the Catholic Apostolic Church. 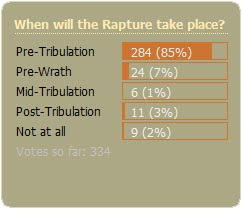 He claims all writings on the pre-tribulation rapture are full of revisions, cover-ups, altercations, deceptions and confusions. Summed up, it's a conspiracy. His books, riddled with errors, have been discredited with lacking historical method. Being an anti-pretribulationist has become his life's crusade." There is NOTHING in ANY scripture or ANY Christian writing ANYWHERE whatsoever until a couple-hundred years ago which says that the GATHERING OR "rapture" of Christians would happen before Daniel's seventieth week. There is NOTHING in any scripture that supports a Pre-trouble/tribulation rapture, and the Bible tells us "ye shall have trouble"
II Thessalonians 2:1-4 clarifies for the Thessalonians that the "rapture" gathering happens on the same "day" as the coming and that "that day" shall not come before the man of sin is revealed or the apostasy (falling away from the church's faith and mission). The same passage also says "Let no man deceive you by any means, for that day shall not come..."
The day and hour only refer to the Jewish new year which had to be celebrated over two days plus one hour, because you could look up and see the moon to know if the new month had started -- but it might be cloudy and you would not be able to see the moon -- GUESS WHAT?? -- Jesus told us that it would be total darkness before he came -- we have to watch when this happens with the other signs. but Cain sacrificed fruit instead of what God told him to do, and Christians will continue to celebrate pagan Christmas instead of Rosh Hoshanna and communion which indicate Jesus' return and our service to Him respectively. Prepare? Like what? Are you building bomb shelters? Hording food? Keeping an arsonal? Please share how you're preparing for the Tribulation. "There is NOTHING in ANY scripture or ANY Christian writing ANYWHERE whatsoever until a couple-hundred years ago which says that the GATHERING OR "rapture" of Christians would happen before Daniel's seventieth week." Interestingly, the truth of Daniel's 70 weeks is also relatively recent. I guess using your logic, that would also make it fallacious or questionable. Know what you mean. How often have you been to a blog where some posttribber has suggested that you Google or x-ray Margaret Macdonald? It's often the same message with different names. They must be generated via one source and then a bunch of people visit blogs and post the comments. Apparently R H Gundry believes (or used to) in a two phase resurrection, according to one of my sources. I haven't been able to verify that yet. Pretribs feel the the first resurrection is one type and the second resurrection is another type. Glen, for a detailed description of the resurrections, please read this article by Dr. Reagan - Resurrections and Judgments. Revelation 20 shows us that this resurrection is POST-TRIB. Rev 20:4,5b reads "And I saw thrones, and they sat upon them, and judgment was given unto them: and [I saw] the souls of them that were beheaded for the witness of Jesus, and for the word of God, and which had not worshipped the beast, neither his image, neither had received [his] mark upon their foreheads, or in their hands; and they lived and reigned with Christ a thousand years... This [is] the first resurrection." Folk's, all I can say is that a familiar spirit is behind any other view then pre tribulation! How saved do you have to be? Are you saying that Jesus was not able to do it all at the Cross?! Do you actually think that some how you can escape these evil spirits that will be given free range during that time? Do you think that your 308's 06's and 44's will keep you and love ones out of reach? What about "Chloros" a word mentioned 4 times in the new testament as the word for "green" and maybe the Pale Horse might mean death! Green, Pale, death as the nation of Is - lam's favorite color! Yes Christians, we will be out of here SOON! Fourth, God has a higher purpose for the church during the future tribulation, a much higher purpose than more tribulation on earth offers. If you believe, as I do, that the twenty-four elders represent the church in heaven, then you find in them our purpose during that hour. They appear four times in the book of Revelation at critical junctures. Study their prayers for God's glory and honor, their responses of praise for God's actions, and think about their active participation in the interactions between heaven and earth. The twenty-four elders - that's you! The victory crowns they wear, you will wear! Who else wears that kind of crown but the church?